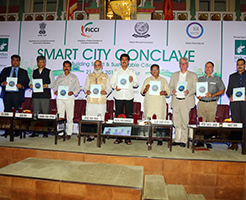 Release of the theme paper on the Smart City Conclave: Shriji Arvind Singh Mewar, Chairman and Managing Trustee of the Maharana of Mewar Charitable Foundation, and the dignitaries at the inaugural session of the Smart City Conclave organized by FICCI, Department of Local Self Government, Government of Rajasthan and Udaipur Municipal Corporation, on May 21, 2016 at Sabhagaar The Durbar Hall, Fateh Prakash Palace, Udaipur. On the dais (from left): Mr Atul Sharma of FICCI Rajasthan chapter; Prof Jagan Shah, Director, National Institute of Urban Affairs; Mr Chandra Singh Kothari, Hon’ble Mayor Udaipur Municipal Corporation;Mr Rajpal Singh Shekhawat, Hon’ble Minister for Urban Development and Housing & Local Self Government, Government of Rajasthan;Mr Gulab Chand Kataria, Hon’ble Minister for Home, Government of Rajasthan; the Guest of Honour H E Mr Peter Taksøe-Jensen, Ambassador of The Royal Danish Embassy, New Delhi;Dr Manjit Singh, Principal Secretary – Local Self Government, Government of Rajasthan; and Mr Sandeep Sinha of Indus Towers. During the inaugural session of the Smart City Conclave, in my address, I drew the attention of the august audience to Udaipur’s unique geo-heritage. My objective was to give the Big Picture for Udaipur as a Smart Heritage City in the 21st century. “Fact 2: Udaipur is a 450 year old man-made city. Its lake-system was developed and sustained by my forefathers who built the City Palace and the city along the Lake Pichola. For over 200 years it has been compared to cities like Venice in Europe. At The City Palace, we have done our bit for water resource management. We set up a waste water management system in place since 1999-2000. It has now been upgraded to 500 KLD in 2015-16, with the consent of the Rajasthan Pollution Control Board. Recycled water is used to irrigate the plantations covering 1 lakh sq. feet area within the City Palace. The Smart City project presents a marvellous opportunity for all stakeholders to work together, utilise the finest of technologies to preserve, develop and sustain our water resources. “Fact 3: Udaipur has emerged as a ‘city of excellence’ not just in tourism but also art and culture, education and sports, entertainment and spirituality. Equal emphasis and focus needs to be given to all these facets in the Smart Heritage City plans. If this unique city gets identified by only one facet, its identity will be diluted. ‘You cannot have fruits without roots’. I recall these words of a management guru. I wish to state: It is the responsibility of today’s planners, law-makers and administrators to nurture the roots. The inaugural session was addressed by the following dignitaries, civil servants and academicians: Prof Jagan Shah, Director, National Institute of Urban Affairs; Dr Manjit Singh, Principal Secretary – Local Self Government, Government of Rajasthan; the Guest of Honour H E Mr Peter Taksøe-Jensen, Ambassador of The Royal Danish Embassy, New Delhi; Mr Chandra Singh Kothari, Hon’ble Mayor Udaipur Municipal Corporation; Mr Rajpal Singh Shekhawat, Hon’ble Minister for Urban Development and Housing & Local Self Government, Government of Rajasthan; and Mr Gulab Chand Kataria, Hon’ble Minister for Home, Government of Rajasthan.